I’ve had this cookbook since last summer, but I had yet to make anything from it. The little blurb before the soup says “it’s an instant cure for colds!”. I can see how it would because it’s so hearty. I felt like the prep time took forever but I’m a slow prepper. Anyways, I wanted to finally try something from this cookbook since I had it forever so I’m glad I finally tried it! I needed to make something for lunch and I wanted something hearty enough to have for dinner as well. This soup was a great choice. Heat olive oil in a soup pot over medium heat. Add the garlic, onion, carrots, celery, parsley, and rosemary to the hot oil. Saute until vegetables are soft, around 5 minutes. Add broth and water. Bring the pot to a boil and then add in the rotini pasta. After 8 minutes add the tomatoes, beans, and pastini pasta. Cook for 6 minutes. When I first put all the veggies into the pot, it smelt so good. The oil worked well to coat all of the vegetables with the parsley and rosemary. I don’t know how much of a difference taste wise chicken broth would be, but I went with vegetarian just to try something different. I ended up getting organic broth and used the whole box. 🙂 I was worried about the pasta. I didn’t know if it would cook all the way but it did! This soup was really tasty, and it just had so much inside of the soup. 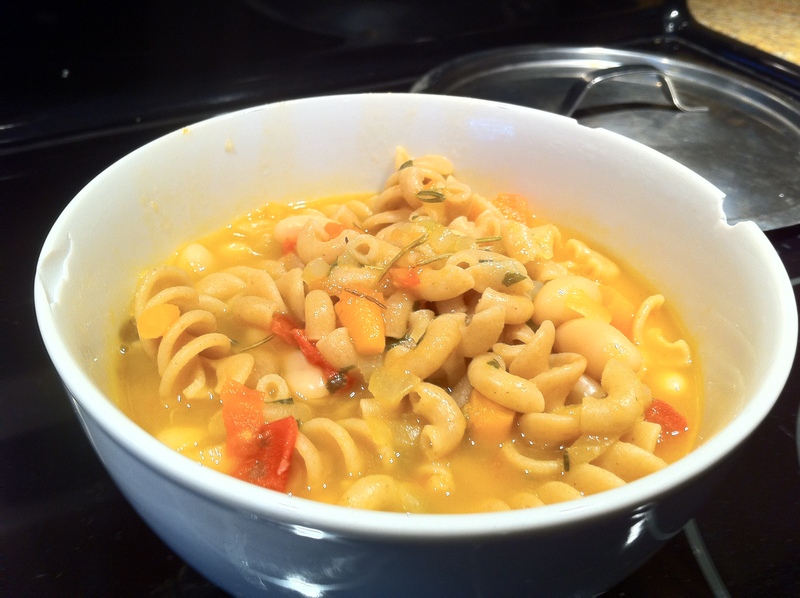 This would be a great soup for a cold day, and I can’t wait to eat some more! Actually, I just had macaroni for lunch. Your recipe looks pretty cool to give a try. Hope you find recipes that you like.